Topper highlights a new product photo online of a Six Wheel Static cart with 49 x 80 dimensions. See full Static Cart Gallery HERE. 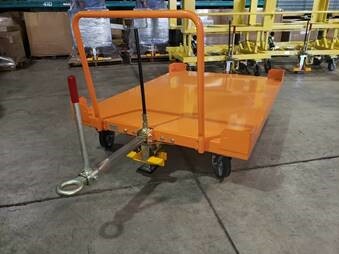 In the new product photo online (Ref: CT304) Topper shares a photo of a six wheel static cart with corner guides for container placement. This type of cart is used for various applications in cart delivery. This six wheel push cart is also able to be tugged. It is equipped with a retractable pintle ring tow package. It has RS Casters. With four outer swivel wheels and two center rigid wheels, the carts have improved heavy duty capabilities and optimal tracking. Previous post "Why Cart Delivery is in High Demand?" Topper Industrial presented at ProMat 2019 in April in Chicago.